Before purchasing, you must first contact Gary to work out the details of what you want. Start by emailing me at help@orientaloutpost.com telling me what you want. This is a personal service, so there are a lot of things to work out first. I've been carving chops since 2010 after learning from Master Xing An-Ping. I take a lot of personal time making sure your chop is perfect to the standards of this ancient Chinese art. The services on this page are specifically for your chop to be carved by Ling Hua. 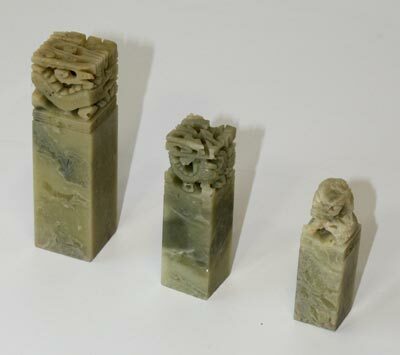 She will carefully design your chop, carve it by hand on a quality stone, and provide you with a one-of-a-kind stamp. Chop sizes 20mm 25mm and 30mm. Note: Color and carving on top can vary. Also, if you plan to use your chop a lot, you may want to have no carving at the top, as this is easier on the hand. 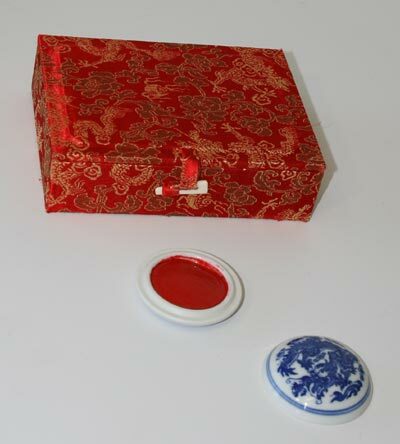 We are out of these silk boxes, but have plenty of ink wells made of porcelain with red clay ink for $5. Expensive ink can cost as much as $50+ but this is a nice medium-quality ink set.